LESSION 1: Choose your own weapon! 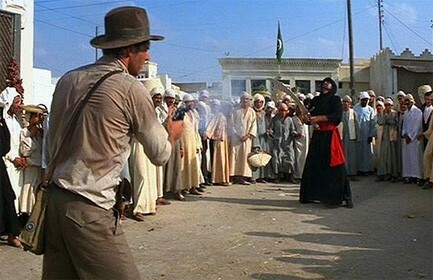 In a Cairo maidan, Indiana Jones came upon a fierce swordsman who challenged him to a duel. The master swordsman waved his menacing-looking sword with great dexterity, and showed Indy a few of his choice moves. What does Indy do now? Does he rise to the dare by borrowing a sword from the crowd gathered? What chance would he have against the well-trained assailant? If you wish to criticize something about Quantum Theory, they will say that you have to be at least as much up on this field as any of their masters. The only people who would meet this criterion are people from the Quantum Theory establishment, i.e. members of their own coterie. Everyone else is excluded. Therefore, Quantum Theory is saved harmless. Beautiful! Now I ask you: Is that premise really true? It sounds perfectly reasonable and straightforward, but is it true? Let us discuss this in the specific context of the discovery of Wilczek, Politzer and Gross. These people developed an extremely complicated, horrendously mathematical theory of what goes on inside an atomic nucleus. Big government laboratories with big budgets and big machines then performed atom-smashing experiments, and reportedly verified the theory. This involved thousands of highly qualified scientists and engineers. They say that you have to on top of all of these and all of them in order to even qualify to criticize them. So the enterprise is perfectly safe. The truth is this: You need know no more about Quantum Theory than you know about “Quantum Leap.” And you need know no more about atom-smashing machines than you know about garlic-crushing gadgets. What you do need to know is how to compare numbers obtained from theory with those obtained from experiment. On a piece of graph. That is all. That is everything. Absolutely. This here is a generic problem. The theory might well concern how many zaftig women stomping on how much red grapes will make how many bottles of chianti per day. The experiment may well be conducted in a vineyard in Frascati. Makes not an iota of difference. So, don’t let other people choose your weapon for you. If you do, you have already lost the battle. They have shaved you without lather. We will keep our lessons approximately at the level of Indiana Jones, and blow sky high this scam by the cleverest of the intellectuals in human history. Now, what did Indy do? He dropped his lasso, pulled out his gun, and shot the man! Simply shot him dead. This entry was posted on April 21, 2009 at 1:37 pm and is filed under Bogus discovery of Wilczek, Nobel Physics discoveries disappearing. You can follow any responses to this entry through the RSS 2.0 feed. Responses are currently closed, but you can trackback from your own site.